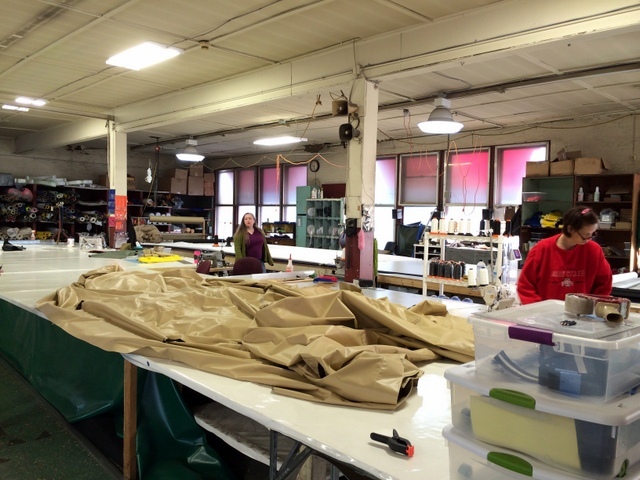 Columbus Canvas Products is a family and woman owned canvas shop in Columbus, Ohio which manufactures high quality canvas and vinyl products with a special emphasis toward “American Made”. 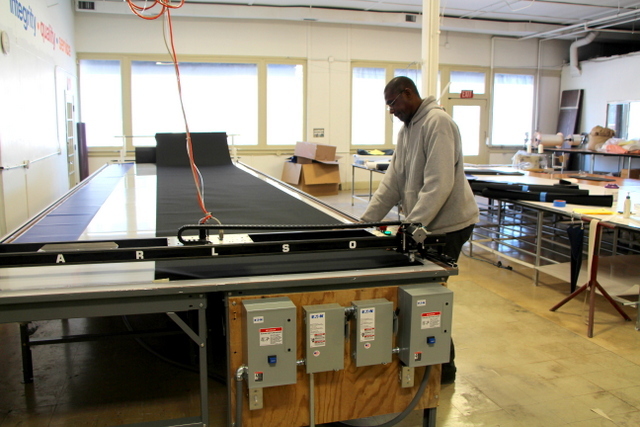 Over the last decade they have seen a steady increase in the size of their projects as they expand into high growth sewn good industries like automotive, industrial contract sewing, equipment covers, medical textiles, bags, and outdoor living. Jan Kellogg, president and owner, explains that Columbus Canvas Products (CCP) was at a tipping point where the jobs coming through door were large enough that they had to to decide, “is it time to grow so we can take these projects or pass?”. At their size, a 500 piece job is a “great deal” and a 10,000 piece job is “probably headed to China”, but what about a 2000-3000 piece job? This size of an order presents a great opportunity for growth, but depending on the order’s complexity, it could tie up the entire shop for months while they try to work out production logistics to maintain quality and repeatability across so many parts. 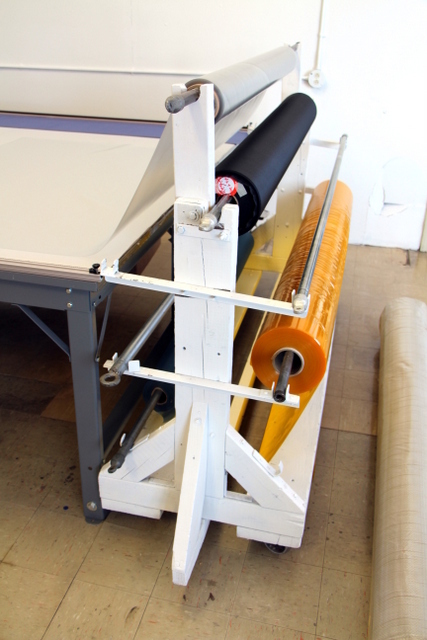 Jan found her simple, affordable, in-house (American made) solution for growth with the the Carlson Design PT-84″ plotter/cutter. Now they can meet increased production demands by quickly and accurately marking and cutting their CAD drawings, all with minimal waste, maximum repeatability, and operated by a single novice operator. 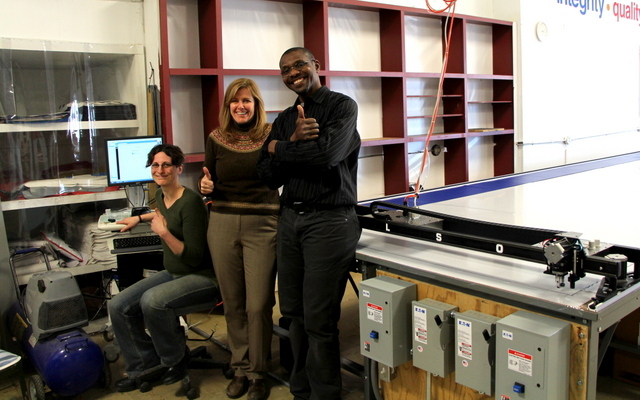 Jan Allen, owner of Columbus Canvas Products, gives a thumbs up with her new plotter/cutter operator, Niki, and awning designer Malik. 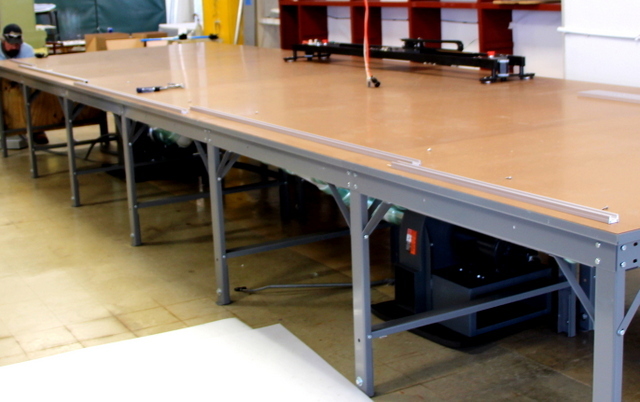 Carlson Design Pro PT-84" Plotter/Cutter on a 7'x28' Phillocraft vacuum table with two 5HP radial blowers. 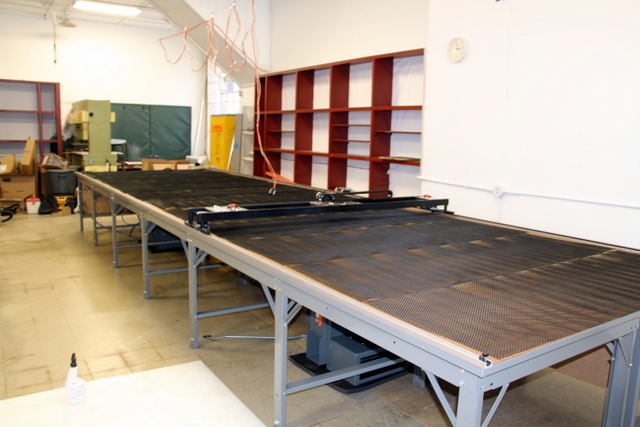 Columbus Canvas Products purchased a PT-84″ Plotter/Cutter on a 7’x28′ Phillocraft vacuum table with two 5HP radial vacuum blowers. They provided their own Windows PC, operator’s workstation, and air compressor. 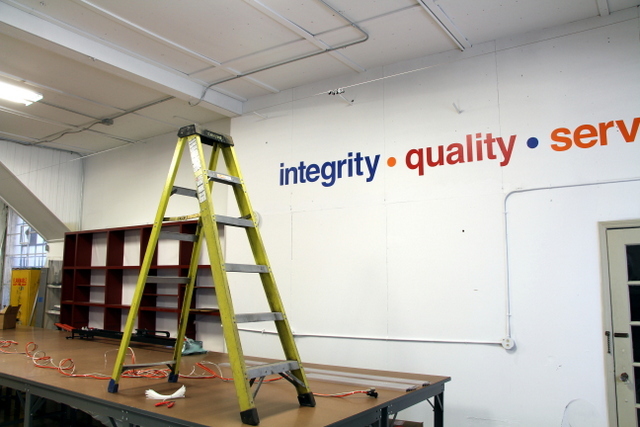 They installed the plotter/cutter down stairs, near their sales and design office where the floor is level and they have a clean, open working environment to stage larger marking and cutting jobs. 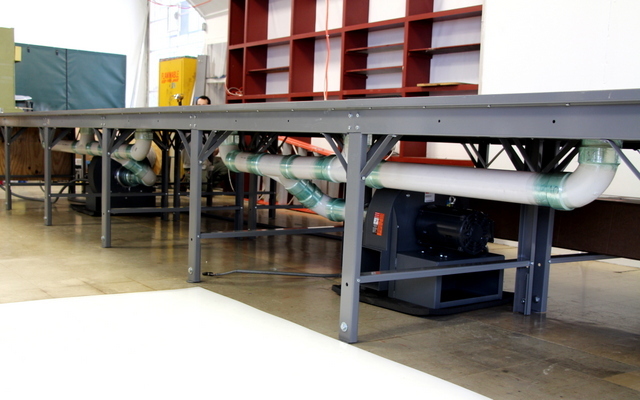 Downstairs: An affordable and reliable solution for growing production in-house. Upstairs: This is where the rest of the magic happens. 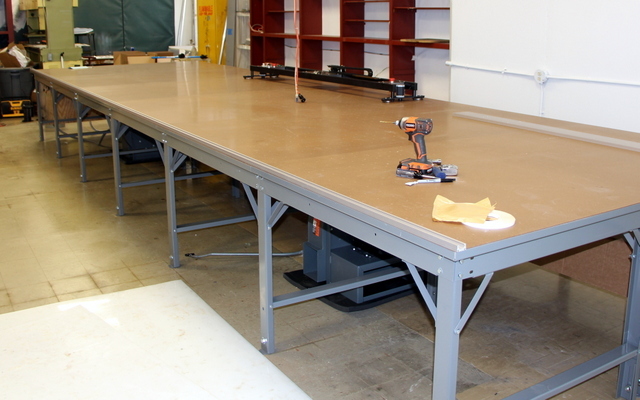 They have long tables with integrated sewing machines for parts sewing and assembly. Carlson Design plotter/cutters can plot/cut patterns from most CAD and design software programs. CCP was already experienced drawing patterns in Adobe Illustrator and TurboCAD. Their designer, Roxanne, likes to use Adobe for drawing letters and basic patterns. Their sister company, Capital City Awning, likes to use TurboCAD for creating photo realistic renderings for their prospective customers. 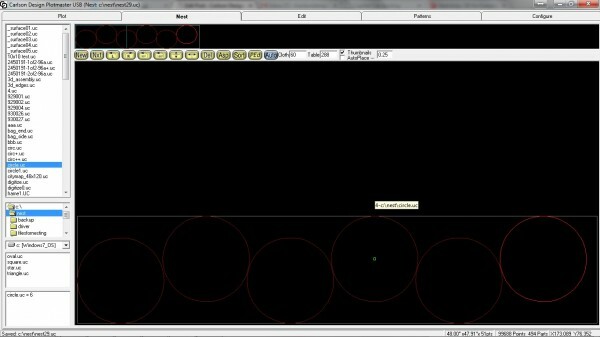 TurboCAD also has parametric design features that allow CCP to easily customize popular jobs. Carlson Design also introduced our free Patterns tab for making basic shapes like circles and rectangles “on the go” AND our plugin for Sketchup – a free and very easy to use CAD program that connects directly with the Carlson Design Plotmaster software suite. You should choose the design program that works best for your work flow. CCP works on a wide variety of custom projects. For training, we took real jobs that needed to be cut and started transitioning their production from hand marking and cutting to the plotter/cutter. 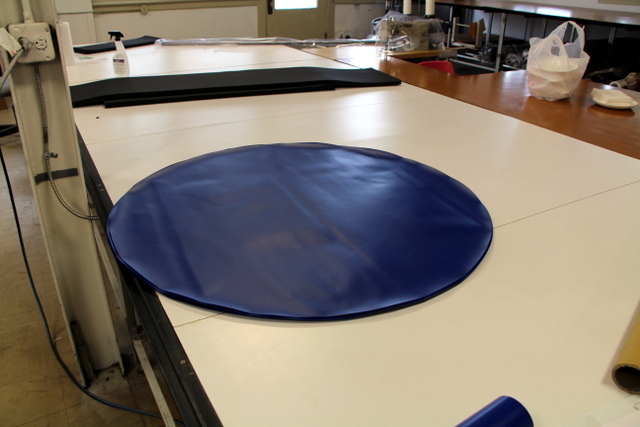 For their first cutting project, we used the Carlson Design Patterns Tab to create a series of six 48″ circles needed for an upcoming job. Carlson Design patterns tab has basic patterning tools for making circles, squares, rectangles, text, and other popular textile industry patterns. This 48" circle was then nested six times in the Nest Tab. 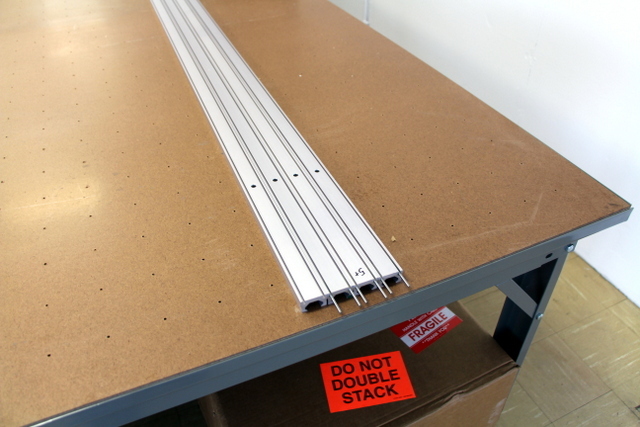 PT-84" Plotter/Cutter cutting identical, nested circles out of PVC. Beautiful stack of PVC circles cut in under 2 minutes with minimal waste. Changing size? Not a problem! Cut a new set of circles with a new diameter in minutes. CCP designed a one piece parking meter cover in Turbo CAD. 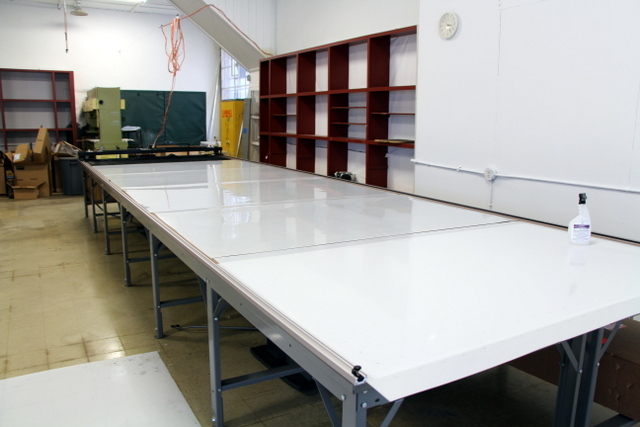 We imported this pattern as a *.DXF and nested 18 covers on their 24′ long table. Cutting 18 identical covers took just over 11 minutes. Niki holds up 18 perfect parking meter covers! Niki is one of CCP’s newest hires. She only had a few months of hand marking, cutting, and sewing under her belt before we arrived. This doesn’t mean Niki isn’t smart, she’s just new to the custom canvas products industry. Now that they have a Carlson plotter/cutter, Niki is applying her previous CAD experience and common sense to run their plotter/cutter. 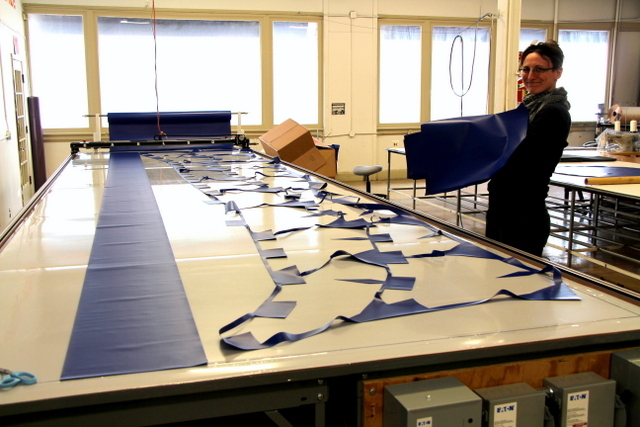 The Big Take Away: With the help of a plotter/cutter, Niki, the newest member to the team, is able to cut 18 identical patterns in 11 minutes with the least amount of material waste. Need more parking meter covers? No problem, tell Niki and she’ll have your perfect patterns ready in no time! Installing new equipment isn’t a holiday from production. 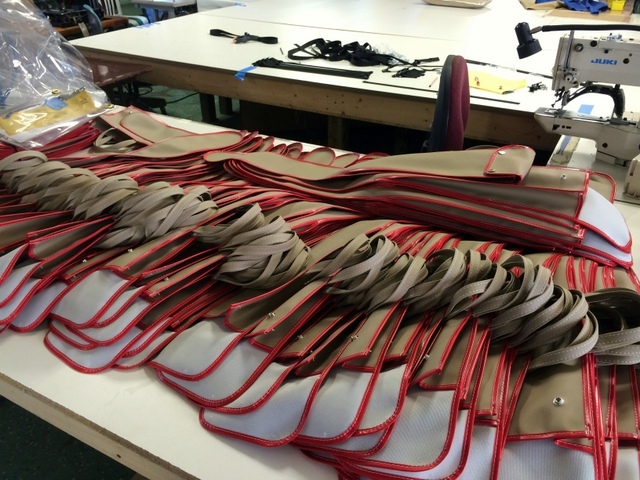 They have real jobs to cut, like five of theses 3 piece bags, also designed in TurboCAD. Niki imported all three pieces and then nested them five times to create five full bag sets with minimum material waste in only 6 minutes. After she pulled material and hit “PLOT”, all five bags were cut in only 5 more minutes. All three of these projects happened on the second day of the install. And this is only the tip-of-the-iceberg for what projects around the shop could benefit from automated marking and cutting. Knight's of Columbus! Look at all these sword sleeves that COULD be cut on their Carlson. Even little projects, like cutting reinforcing patches, get faster and more repeatable when automated. Using the rectangle maker in the patterns tab and nesting, these small patches can easily be added to "waste" areas on large jobs. 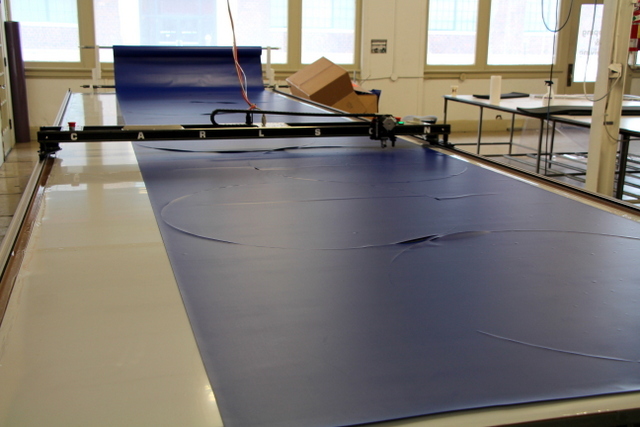 The plotter/cutter allows you to grow production and/or meet seasonal demand, without needing to add temporary personnel. 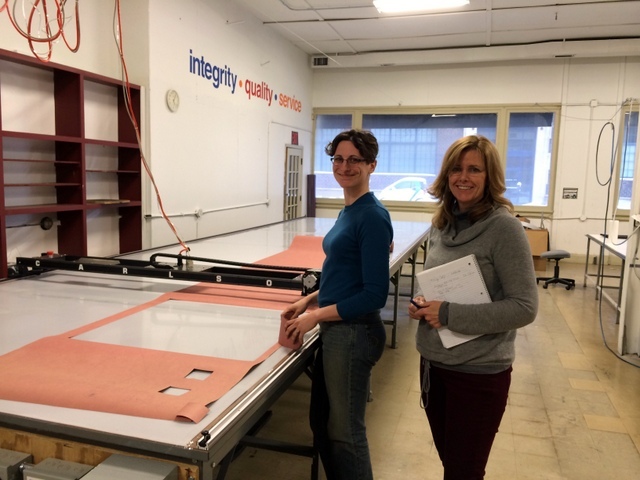 On the third day of training we invited Malik, an awning designer/cutter from Capital City Awning, for a show-and-tell day with the Plotter/Cutter. That is, he shows Niki HOW TO MAKE AN AWNING and she tells the plotter/cutter what needs to be marked and cut. Every awning is made a little different. 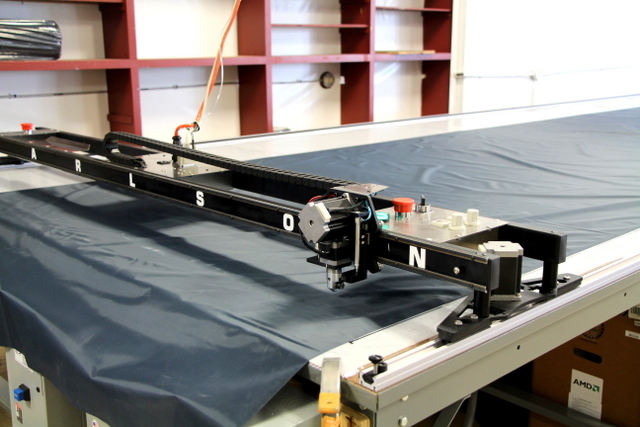 An experienced awning cutter is a skilled craftsman and can an turn a list of dimensions scribbled on a “cut sheet” into a beautiful marked and cut awning with incredible speed and accuracy. BUT, a new awning cutter may take hours or even days to mark and cut that same job. Even with extra time, it may never have the quality and precision of a skilled craftsman. Field notes for an awning must be translated by an experienced cutter and sewer. 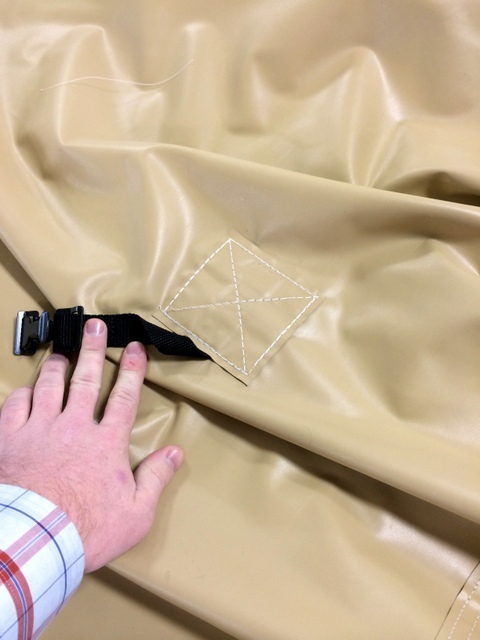 Only the expert knows where to add extra material, correct seam allowances, and part orientation. Our first Awning project was for a 19′ wide awning with a 15′ 2″ projection. We used our free Sketchup plugin and Malik’s knowledge of how an awning is made to design their awning on the computer. We drew their awning in two parts — the wings and the projection panels. It took approximately 40 minutes to design, nest, and optimize all of the cuts for this particular awning. Below is an old demo video of how to draw a wing in Sketchup. The body of the awning was broken into six panels. 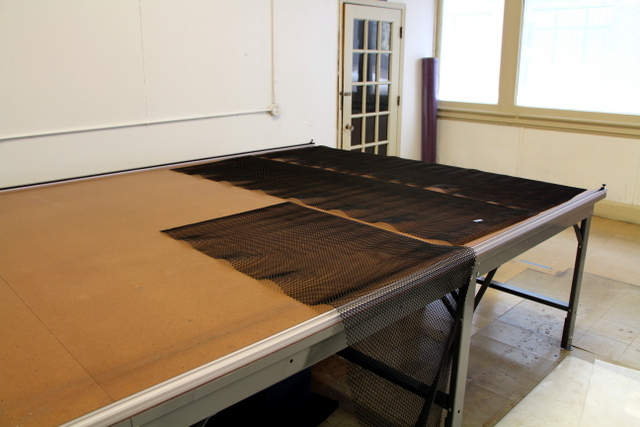 Each panel has marks for seam lines, the drop, wrap, and rafter pads. For this particular awning, the four interior panels were identical. We could fit one panel per table and needed to cut four tables of this interior pattern (52 seconds each), two tables for the end panels (1:18 each), and two tables for the nested wings (2:35 each). Total cut time with loading and unloading for all marking and cutting was about 20 minutes. 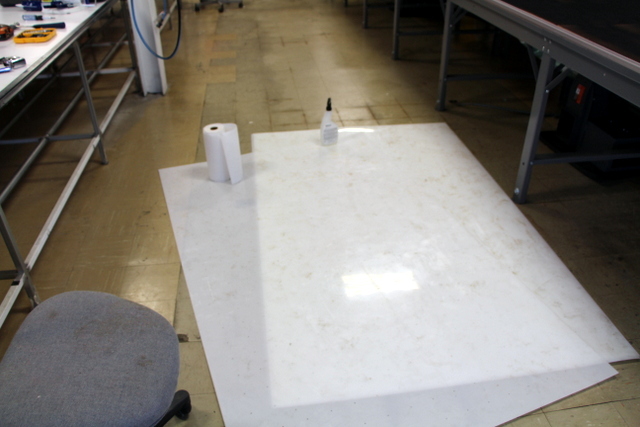 Malik spreads acrylic down the length of the table. Align one edge of the material with table alignment mark before turning on the vacuum. This is an amazing video of marking, cutting, rolling, and repeating. 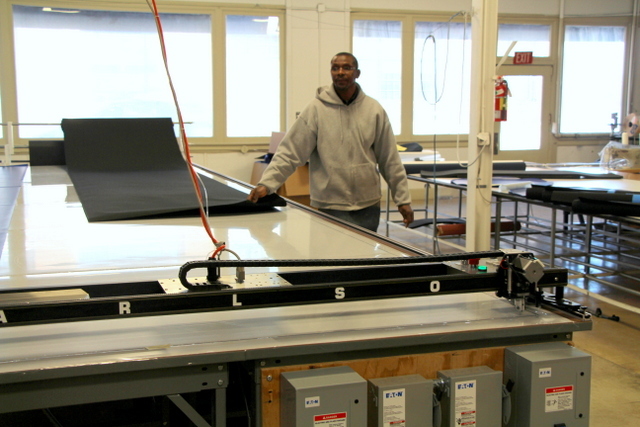 Malik and Niki are able to mark and cut two identical panels in four minutes ON THEIR FIRST ATTEMPT TO MAKE AN AWNING! We use a sharpened soap stone in the pen holder to mark acrylic fabrics (ideal because it is easily rubbed off later). 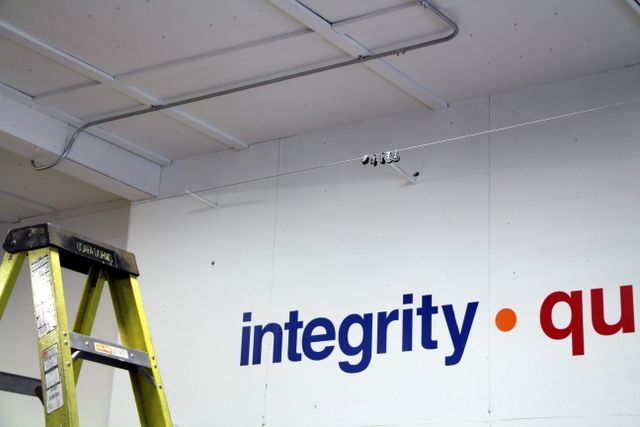 We measured this job’s material width before starting and divided our panels into 46.25″ sections to match. This way they are can cross cut their patterns to utilize the selvage edge of the material. After each cut, the machine PARKS at the end of the table giving the operator an opportunity to remove the cut panel before sending the machine HOME to cut the next one. 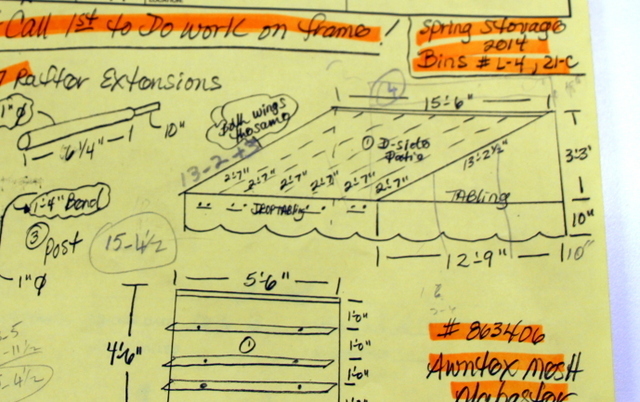 Using a CAD program to drawn the wing of an awning allows the operator to quickly and accurately find he hypotenuse. The wing is also divided into 46.25″ wide sections, which are easily nested together in the nest tab to maximize material efficiency. Cutting two identical wings with almost no material waste takes less than 7 minutes. For the last panels, no material goes wasted. 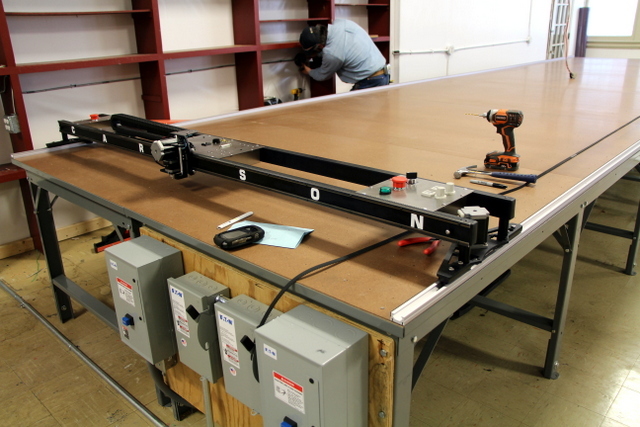 They use the extra space to nest a rafter panel, saving material and time by combining two cuts. 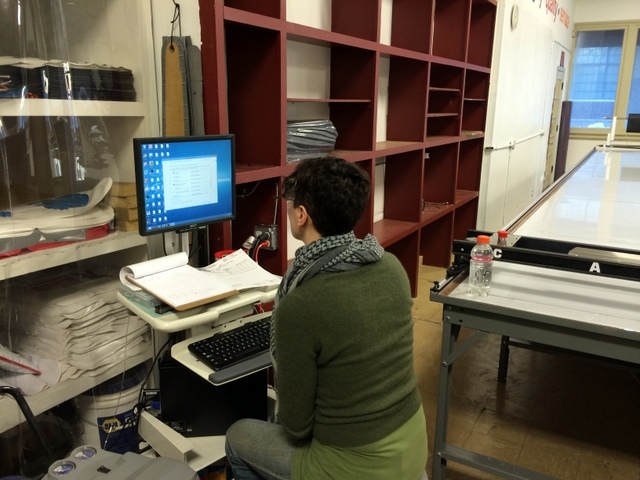 At the end of the cut, Niki demonstrates how to manually cut the roll off using the “saw” feature in Plotmaster. Simply drop the cutter and use the arrow keys on the keyboard to manually control the cut path. The Big Take Away: We designed, marked, and cut an enormous 15’x19′ awning in 1 HOUR. Not that fast?? That’s their first automated awning plot/cut with Niki asking Malik how-what-when-why he made each mark from the job sheet. With a little practice, Niki (with no previous awning experience) will be making awnings on her own in 1 HOUR. With training from expert cutter Malik, on how to read the drawing, novice Niki can design and cut all of the parts for an awning in 1hour. Most of that work is sitting at a desk! This last project isn’t new, but it is a different sized awning out of a different width of material. We are still marking with a soap stone, which is still visible even on this lighter material. A quick comment on speed: Think about your car’s speedometer — it doesn’t matter how fast it says you CAN go if you are stuck driving in a neighborhood. Plotter/Cutters face similar limitations based on the job and the environment. The pen speed is set at 15 IPS (inches per second) – any faster and the soap stone line won’t show up OR the tip will break off. The cutter speed is set at 30IPS (~1meter per second) – any faster and the material might shift during the cutting process. To prevent shift at higher speeds they would need to change their blade very often AND/OR add additional vacuum blowers or other techniques for improving material hold-down. Running a little slower will actually save more time and money in the long run. Our traverse speed is set very fast at 50IPS — when both pen and cutter are in the UP position there is no worry of material shift OR marking issues. In this video we have turned on “CUT ROLL OFF”. This feature allows the user to set a clean cut off at, or just past, the last cut on the table. This way the operator has a clean, straight cut to start the next run. Now that we’ve looked at five different projects they cut in the first two days of operation, let’s look at how they got setup. 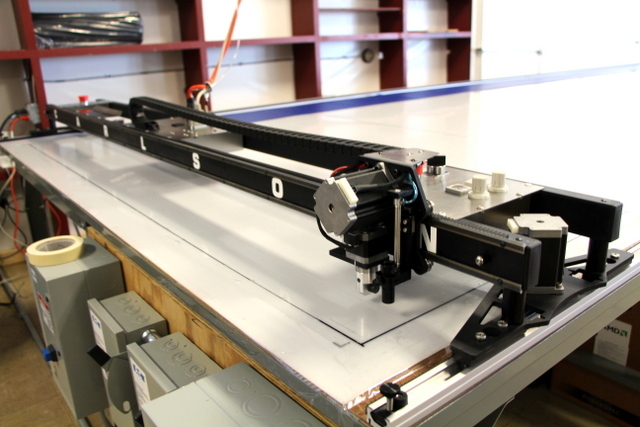 CCP ordered a PT-84″ plotter/cutter, 24′ long vacuum table, vacuum blowers, and onsite commissioning from Carlson Design. They provided their own Windows PC, operator’s workstation, and small air compressor. We flew to Columbus on a Tuesday, right before a big winter snow storm. Despite the snow, the install began early Wednesday morning and was already ahead of schedule thanks to the time and effort they took to pre-assemble the table before we arrived. This shaved hours off our setup time allowing us to start training by 3PM the first day! 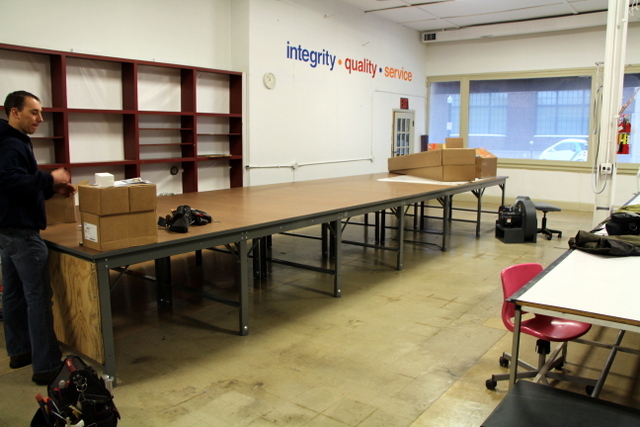 Phillocraft tables are easy to assemble. 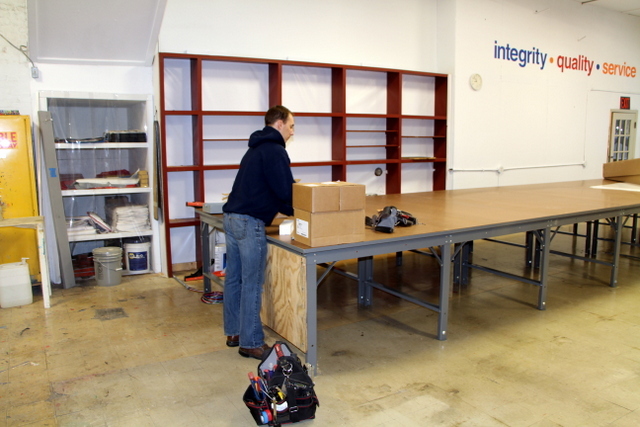 CCP decided to assemble their table before we arrived, which allowed us to begin training by 3PM on the first Day! Their electricians arrived the first morning and began wiring the vacuum blowers and motor starters. The table was pretty level and square when we arrived. We used their floor jack to adjust a couple of legs, but otherwise the table was very well prepared. A level table is a fast table. The plumbing is clearly labeled. Layout all of your parts before assembling. 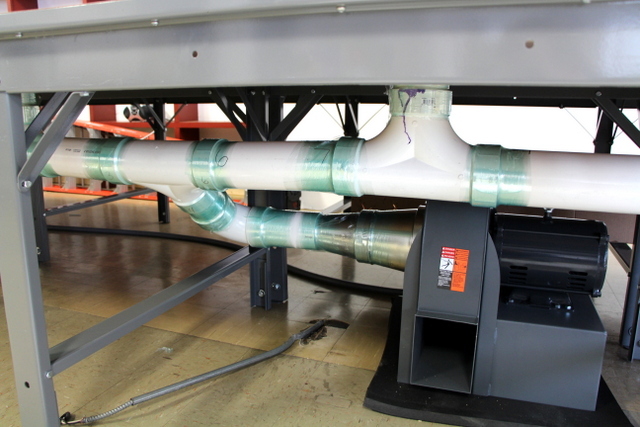 Sheet metal reducers connect the 8" blower inlet to the 4" PVC plumbing. 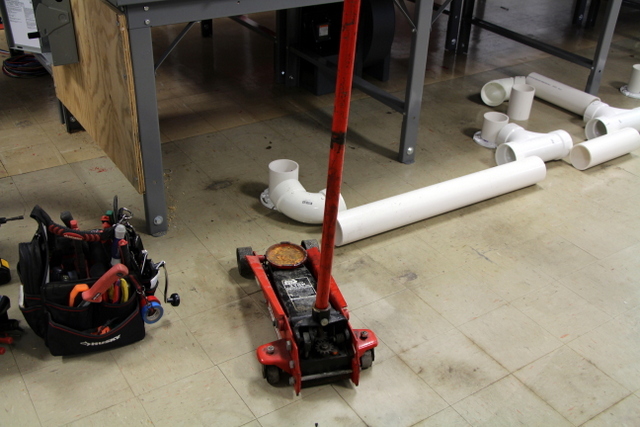 Use silicone and hose clamps around the reducers to prevent vacuum leaks. 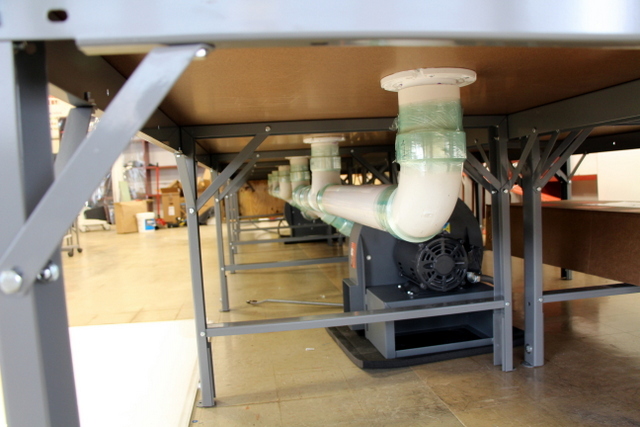 Position your blowers under the table near their final location. This will help the electricians start running wire. Make sure they run a little extra wire so you can move the blower later, as needed. 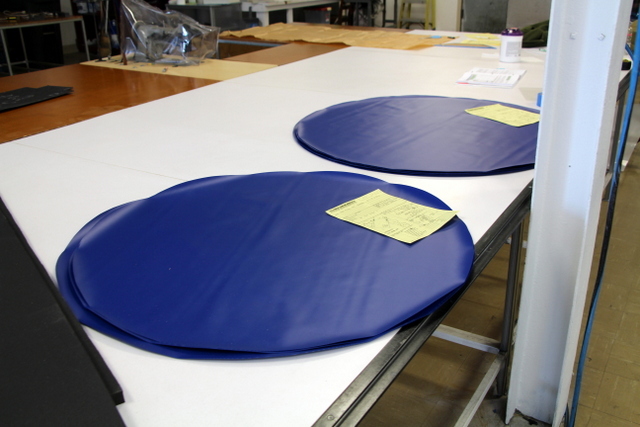 Placing the blower on a rubber mat will reduce vibrations and prevent movement. 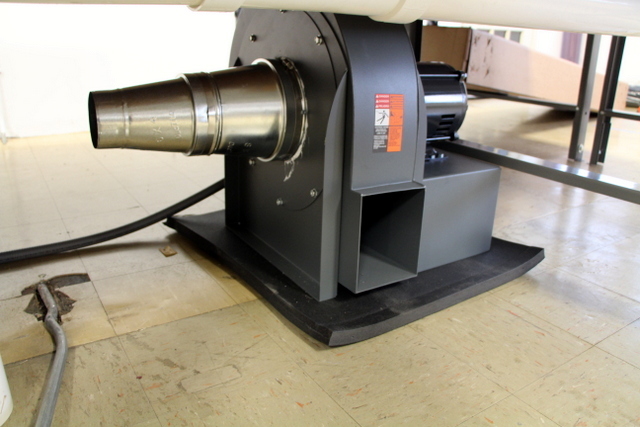 You can anchor the blower permanently once you know its final position. 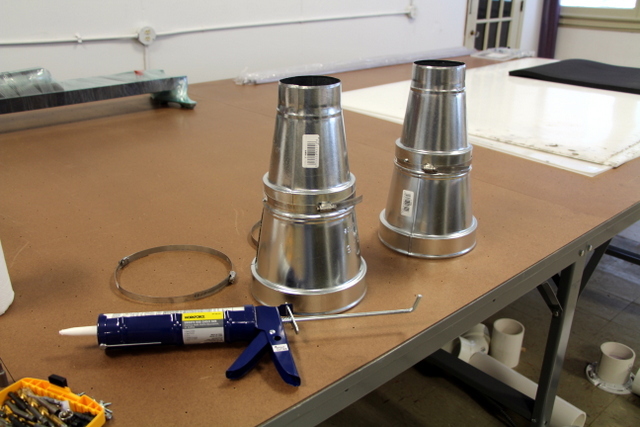 Attach the reducers - silicone, hose clamp, AND secure to the blower flange with three or four #6 sheet metal screws. 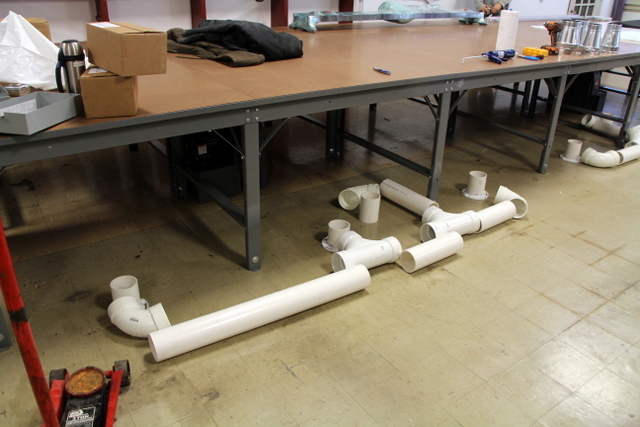 Attach 4" PVC fittings and flanges to the table. Only PVC glue vertical connections. 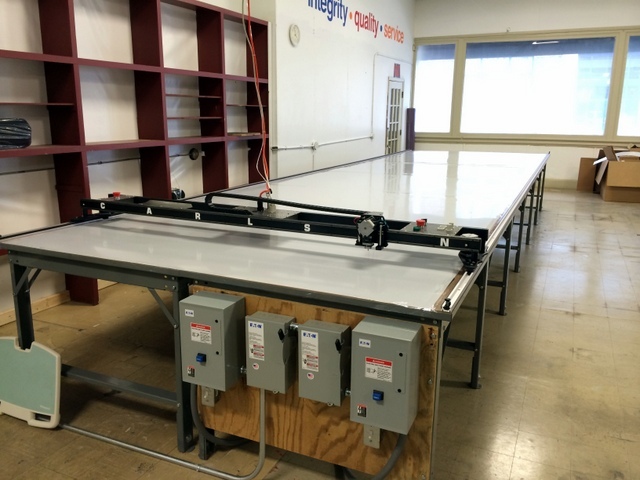 Horizontal connections are left loose for easy reconfiguration later (ie you need to move the table or add a blower). Connect the plumbing. If you are installing on your own, it may be helpful to have a second set of hands. Wrap all connections with supplied stretch wrap to prevent vacuum leaks. Connect the blower to the plumbing. 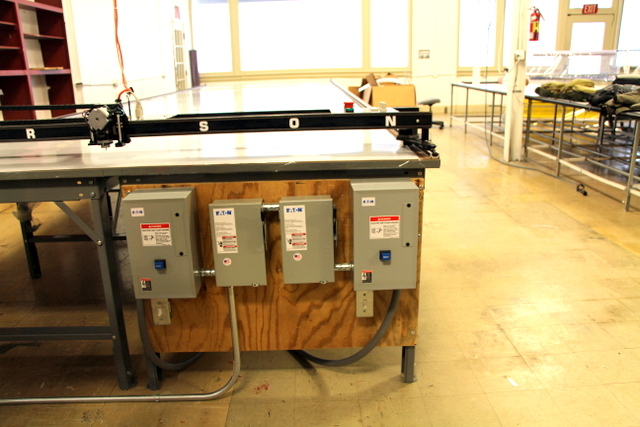 Carlson plotter/cutters are controlled by three connecting cables -- an air, power, and signal cable. There are many ways to run these cables, including on the side of the table, centered overhead, off-center overhead, or in a side-mount echain. Running the cables overhead is easy to do and keeps the cables well out of the operator's way. They strung a steel cable between two walls and secured it to a stud on each side. A turnbuckle is used to tension the cable. 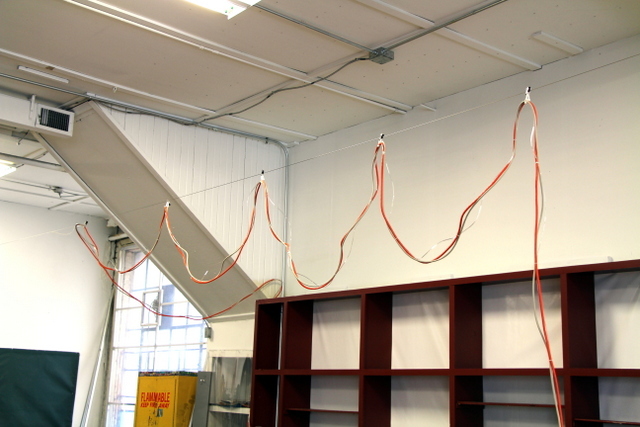 The three cables are loosely zip-tied together and hung on marine-grade pulleys. Install the track. Loctite pins in the end of the track before connecting. Carefully follow your instruction manual to secure track side A to the table. Drill a pilot hole and manually screw each #10 screw to prevent shifting the track or over tightening. Attach the track belt to side A. Thoroughly rub the track belt with acetone before taping. Attach double sided tape to track side A. Attach belt to track side A. Apply belt with even pressure. You will want to apply side B's belt with this same pressure. 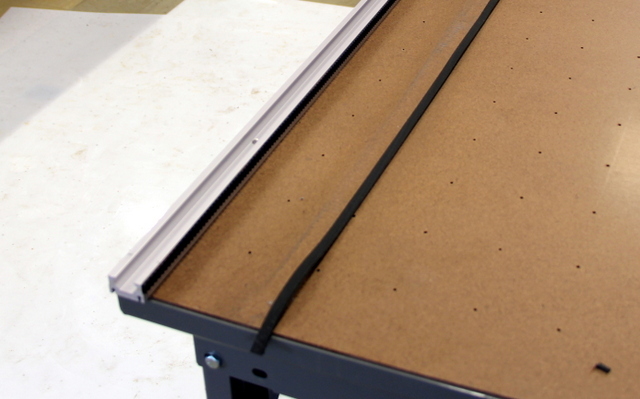 Use the plotter/cutter as a jig to keep both sides square and attach track side B. Spread breather mesh across the table. 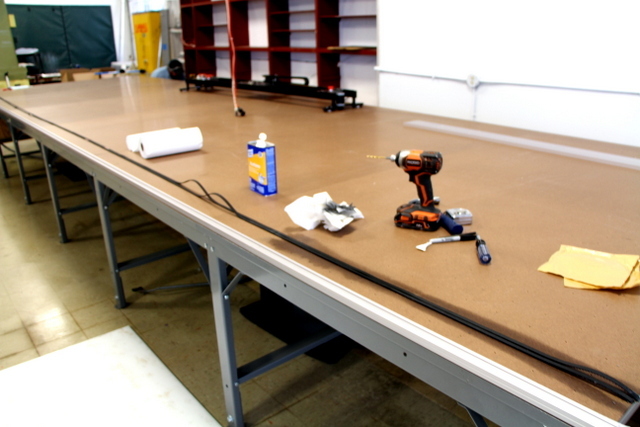 This creates an air channel between the table top and cutting surface. Roll the mesh across the width of the table (instead of down the length) and you will be able to cover more area with fewer rolls of mesh. If dirty, clean plastic cutting surface before attaching (cosmetic tip only). Place cutting surface on top of the breather mesh. Be careful not to shift the mesh while placing the sheets. 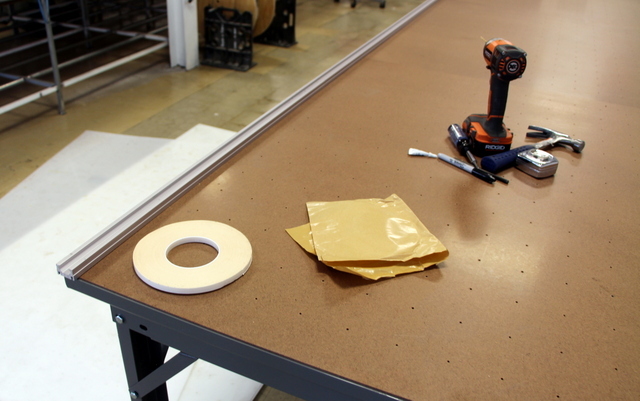 Secure sheets to the table top with packing tape. 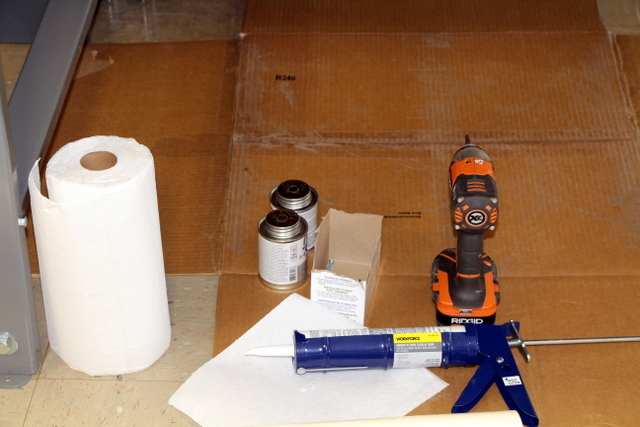 Do not screw, glue, or double-sided tape your cutting surface to the table. The electricians wired each blower to its own motor starter per local code and the buildings electrical specifications. On/Off switches are conveniently wired near the operator's workstation. 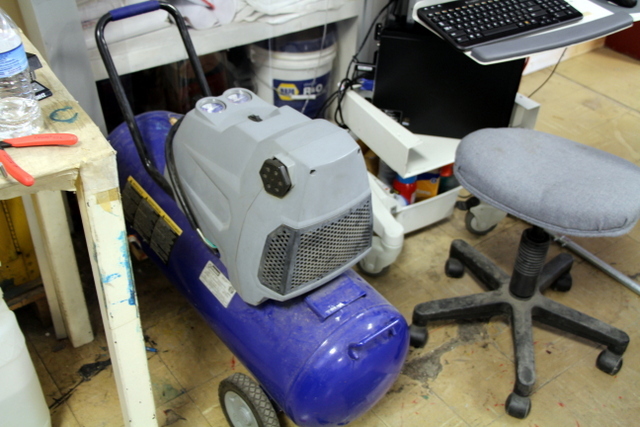 They provided their own air compressor, which is also used for their grommet machine upstairs. 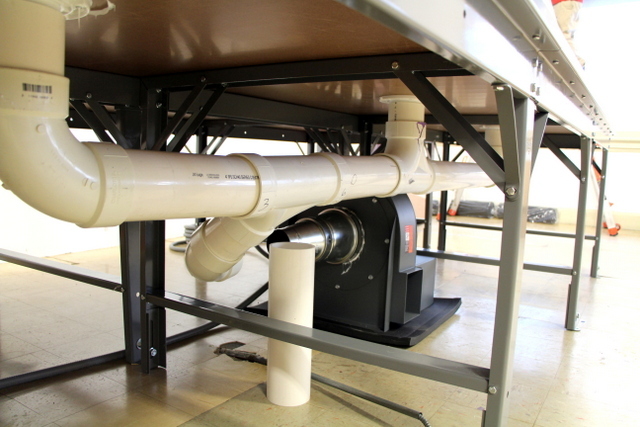 Our system's minimum air requirements are 1CFM @ 90psi. If you already have a compressor or shop air, you can should be able to connect your plotter/cutter to it and we provide standard a universal quick release fitting. If you need to purchase a compressor, we recommend a small, ultra-quiet air compressor (available from Carlson Design for $200). They incorporated their existing, homemade material roll holder at the far end of the table. Use what you have! They turned an old medical cart into their operator's workstation. Thanks to CCP's hard work and preparation we were able to start calibrating, test cutting, and training on the first day! Jan and Niki are all smiles at the end of a LONG first day. This is a great application for our system and we are excited to see what amazing products Jan and her team produce with their new automated marking and cutting capabilities. This was a fun install and we’d like to give a BIG THANK YOU to Jan, Niki, Malik, Roxanne, Igor and the rest of the team for making us feel right at home in Columbus, Ohio.